I mentioned the launch of the Magic Theatre club back in November 2007. Well, they are about to hold their 4th event on Saturday 19th July and are moving from the Rivoli to the amazing looking Bloomsbury Ballroom in central London. Venues don't come much more exclusive than this! The idea behind the Magic Theatre is to create a "magical event in London for whoever you are and whoever you want to be". 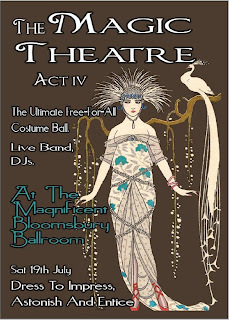 The Bloomsbury Ballroom has been chosen for its "sumptiously exotic interior [...] the perfect place to make a grand entrance [...] in all your finery against the dramatic backdrop of La Belle Epoque". Of course no ball would be complete without dancing, and to that end there will be vintage sounds from DJ Nick Hollywood (Club Montepulciano) and 60s-influenced live band The She-Creatures. Tickets are priced at £14 in advance or £16 on the door and the event runs from 8pm-3am.